I've been working on my second modern Improv quilt using Sherri Lynn Wood's book, The Improv Handbook for Modern Quilters--A Guide for Creating, Quilting and Living Courageously. This quilt is based on Score #9 in the book. Working on a quilt based on Score #9 is "living courageously!" Especially when I went from making "Woodland Friends" based on "Score 1" to this one! These curves definitely require advancing piecing skills! But Sherri has great "how to" advice in the Techniques section in the book which is really helpful. But then I went back and looked at the book. 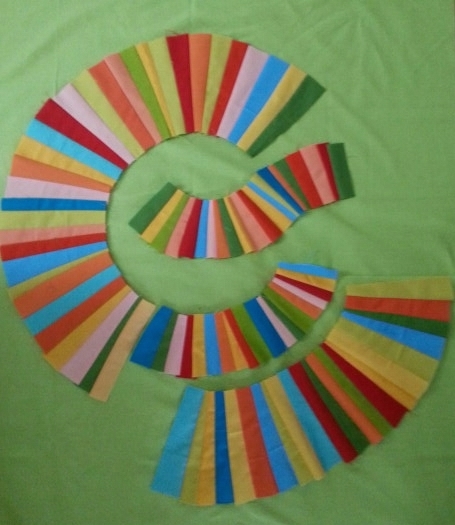 While Sherri states that it is fine to appliqué the curved sections, the examples of "Score #9" quilts in her book are all pieced. The pieced quilts are beautiful. So I decided I was going to rise to the challenge! I ripped out all my hand sewing and started piecing. The photo at the top shows the quilt in a fairly early stage of piecing. The process of turning this from a collection of curved wedges into a rectangular quilt was much like working on a jig saw puzzle. Every evening I would look at the quilt, audition another color. cut one new piece and then sew on to the quilt. It was mentally challenging. One new piece an evening was about all I could manage! I was working on my "Dog Pals" quilt at the same time--doing those fast, raw edge appliqués provided the comic relief I needed to stick with all this complicated curved piecing! Sherri writes in her book that as you start to piece these curved wedges together, the quilt form changes. So true! You can see how different my final layout is from the one I started to appliqué. Here's it is sandwiched, ready for quilting. The quilt is an approximation of a rectangle! That's improvII A slightly lop-sided "organic look" is just fine! This was a great learning experience. Now that I've pieced this quilt and understand the mechanics better, I think I'd like to try it again...but probably not this week!